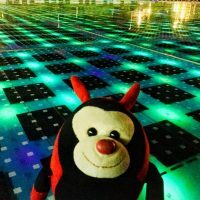 When Travel Bug was ‘splorin’ round the Old Town in Zadar, he heard a strange noise and took off to see where it was coming from. When he got to the edge of the peninsula, he heard the ghostly chimes of an organ. As it turns out, Zadar has pipes under a set of stairs leading into the Adriatic Sea. When the seawater laps against the underground pipes, they produce a haunting tune. Zadar is famous for its cherry flavoured liqueur, called Maraska. The drink comes from the Marasca cherry, a type of sour Morello. The cherry grows best along the Adriatic Coast of Croatia and Zadar’s cherries are the highest quality in the world. Croatia’s star football player learnt how to play football in the parking lot of the Hotel Iz in Zadar, where he was a refugee. He and his family were displaced by the Serb-Croat war back in the early 90s and the family’s house was destroyed. This forced them to move away from danger and they were eventually placed in the city. Modric played for Zadar for a while before it became apparent that his skills were too good. He was then transferred to Hadjuk Split. Travel Bug watched Modric play for Croatia at the World Cup and though he was v v good. Do you have any other fascinating facts about Zadar to share with the Travel Bug?? Hasta pronto, amigos! See you soon, friends!